What is Trend Trading and how does it work? Trend trading (or trend following) is an outstanding way to profit from large moves in the markets without spending a lot of time in front of the computer. Trend traders identify trends and find low risk entry points from which they hold their position until the trend reverses. This style works in most asset classes and can be highly profitable given sufficient diversification, strong risk control and the discipline to stick to the system. A trend is simply a sustained price movement in one direction. This may occur in any financial instrument. Trends occur in stocks, futures and forex markets. They occur in all time frames, however, the longer the time frame, the larger and more rewarding trends can be. The nature and magnitude of trends varies by asset class, however, trend following can be used in stocks, futures and forex markets. Trend following works effectively in the stock market, futures and commodity markets and in forex / currency trading. There are, however, some slight nuances which are discussed below. Stock trends occur because of changing fundamental conditions for the stock and also because of overall market sentiment. Both long (up) and short (down) trends in stocks are tradable, although long side trends can be substantially longer than short side trends. By far the best trends in the stock market occur when a company is growing rapidly and the broader market sentiment is increasingly positive. However, strong stock trends can occur at any time. With a total universe of many thousands of stocks globally, there are always some good trends underway – your trading system’s job is to find them! Trend following stocks on the long side also has the added benefit of the trader receiving dividends for the duration of the trend – bringing the benefits of income as well as capital gain through the appreciation of the stock price. You can see why trend following stocks can be so profitable – you only need a couple of these great moves each year to offset your numerous small losses and you can earn substantial returns. With good risk control and diversification this strategy can perform very well indeed. In our trading systems section you will see that these trends can be identified and exploited using simple mechanical trading systems which look only at price data – it is not necessary to do hundreds of hours of fundamental research to identify a stock that is trending and profit from it. Trend trading in the futures market can also be extremely profitable. Similar to stocks you will find that long side trends are larger and more profitable than short side trends, but both are tradable. The important distinction for trend following in futures and commodities is that because futures contracts expire, the trader may have to intermittently roll over to the next contract month to stay with the trend. These contract rolls add a slight degree of complexity relative to stocks, but this is well worth it given the additional diversification and returns that are available through trend following in futures. Just as in stocks, futures trend following can be undertaken on a purely mechanical basis using only price data. Trends in futures markets may not be as dramatic as the stock trends you saw above, but there are many examples of great trends in the futures markets. A trend in gold is illustrated below using continuous contract price data. There are a limited number of tradable futures markets globally (<100 depending on your definition of tradable). This means there are typically fewer trends at any one time in the futures market compared to stocks, so it becomes important to catch every major trend that occurs when trading futures or commodities. If you miss a trend in the futures market, that may just have been the big one that would have made your entire year’s profitability…whereas if you miss a trend in the stock market, there will likely be many more trends for you to catch. This has some implications for how you structure your entry trigger for futures trades compared to stock trades. Despite this drawback, trend following in the futures markets is extremely powerful because there can be much more diversification between futures instruments than there is between stocks. This diversification can give a futures trend following system higher risk adjusted returns than a stock system because stocks tend to be so highly correlated to each other. A forex trend occurs when one currency strengthens in comparison to another currency. For example if the Australian dollar is strengthening because Australian interest rates are going up (making the currency more attractive) and the US dollar is weakening because interest rates are dropping in the US, then the AUDUSD exchange rate would likely exhibit a good trend. Just as in stock and futures trend trading, a forex trend following system can be based solely on price movements and perform well over a long period of time. Forex trend trading systems can have the same mechanics as stock and futures systems, however, the selection of currency pairs to trade is important because of the high correlation between many currency pairs. Generally the best forex trends occur in the USD exchange rates rather than the cross rates between other currencies. Below is an excellent example of a forex trend in the Australian dollar exchange rate (AUDUSD) that could have been traded using this strategy. How does trend trading work? Trend trading is simply an approach in which you identify that a trend is in place, enter the market in the direction of the trend and hold the position until the trend reverses. After entering at a low risk entry point, trend following generally uses an initial stop loss point which is fairly close to the entry point. Once a trade is profitable a wide trailing stop allows plenty of price movement before exiting a trade. This ensures you remain in the trade for the duration of the trend and don’t exit too early. The wide trailing stops work because trends can get volatile and may move against you quite a way before rocketing off in the desired direction again. If you use too tight a trailing stop then you will be forced out of the trend and miss out on the potential profit from the big move later in the trend. When your trend following system is right (around 30% of the time) and the trend continues, large profits are made on the trade. When the system is wrong (around 70% of the time) you exit quickly at a small loss and moves on to the next trade. Trend following systems make money overall, even with this low percentage of winning trades, because winning trades are much larger than losing trades. New traders looking for reassurance that they are doing well expect reassurance to come in the form of winning trades – these may be infrequent with this trading strategy. However, total profitability is what we should really be interested in, not just being right. Can a trend trading strategy fit in with a day job? YES! Trend following is a form of trading that can be learned and can fit in easily with whatever else you have in your life at the moment. Trend following strategies should not involve any judgment, so assuming everything is documented properly in your trading plan the decisions are very quick to make on a day to day basis. Our major stock system takes about 30 minutes a day to execute. What are the components of a Trend Trading Strategy? Trend following strategies are simple systems that mechanically identify when a trend is in place. The system gets you in to ride the trend as long as it remains in place. They are applied to a broad range of securities or instruments and so need to be simple and robust to work effectively. The correct approach to each of these trading system components for a good trend trading system is described in our trading systems section. Trend following strategies typically do not employ profit targets or time based exits because profits come from letting trades run and develop for as long as possible within your chosen timeframe. Profit targets and time based exits are more commonly used in swing trading and mean reversion systems. What does a successful trend trade look like? As an example of how a trader may benefit from one of these trades, lets say you entered Incitec Pivot (IPL - Australian stock shown in the chart above) on a 200 day breakout on 24 Dec 2006 at $0.79 with a 3 ATR initial stop at $0.75 and risked 1% of your $100,000 account on the trade. You then held the trade and used the 200 day moving average as a trailing exit point which kept you in the trade until 11 August 2008 at $6.23. On the above trade, risking 1% of your hypothetical $100K account you would have risked $1000 on the trade, which would have allowed you to purchase 25000 shares (Number of shares = Dollar Risk / Risk per share = $1000/($0.79-$0.75)). This would give a position size of $19,750. According to the above example, when the position was closed the shares had appreciated to $6.23 per share, giving you a total profit of $5.44 per share or $136,000 PROFIT. This translates to a 136 times return on your initial $1000 risk. Warning: This trade is a hand picked example and is not typical. There are no guarantees you will get trades like this. However, these monster trades can come along every so often though, and this strategy is a good way to profit from them. Trend trading systems which have the potential to capture monster trades like this one are discussed more extensively in our Trading Systems section. 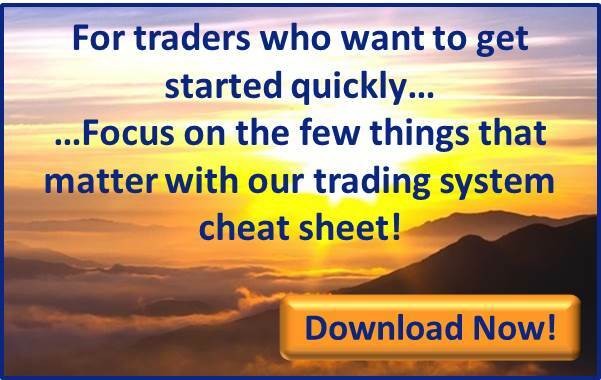 What trend trading software do you need? To explore a trend trading strategy and ultimately develop a trend trading system, you will need a charting package, daily market data covering the markets you intend to trade and software capable of backtesting and optimizing your trading strategy.